Stella Arnaldo's Blogspot: Proud to be a Theresian! GOT my STC Swatch last Friday, and I loveeet! It's not so evident in this photo but it has a bubble top dome. Cute no?! It's P3,500 and great for everyday use. You don't need to reserve at all. 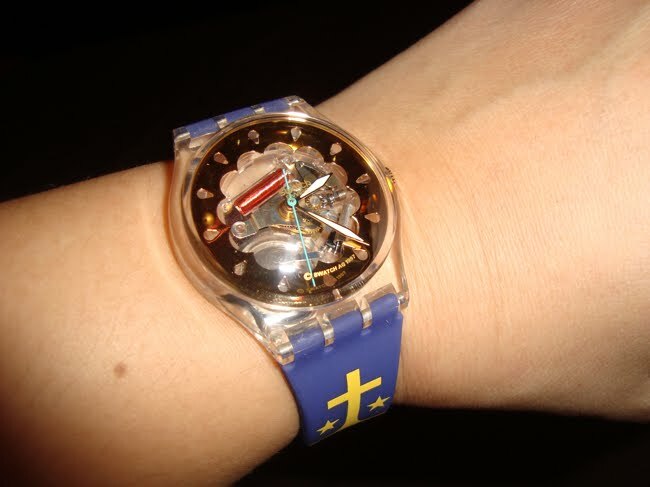 I just walked into a Swatch store last Friday and bought it. There are a lot of stocks on hand. Buy na! (UPDATE): As per Millet Abesamis, from said batch, they are selling the STC Swatch to raise funds for their alumni homecoming next year (Jan. 2012). A portion of the funds raised through the sale will also go to the St. Theresa's Alumni Association "to finance scholars and other causes," representing batch '87's donation. Good for you girls! Keep up the good work. Cute, indeed! I'd love to buy one for my daughter this monthend.